created for managing online hotel reservations and distribution on IDSs and GDSs. Developed by analyzing the demands of hoteliers, myCRS is now the most advanced, versatile and competitive technological solution available to meet the needs of revenue management and reservation managers. A sophisticated system with 2-way, integrated IDS and GDS distribution, it offers High speed synchronization, Guaranteed update security and Management from one single program. The system has integrated GDS connectivity with code OK, Alesia Hotels. myCRS is an international application available in 28 languages, can be used in any time zone and manages all currencies. 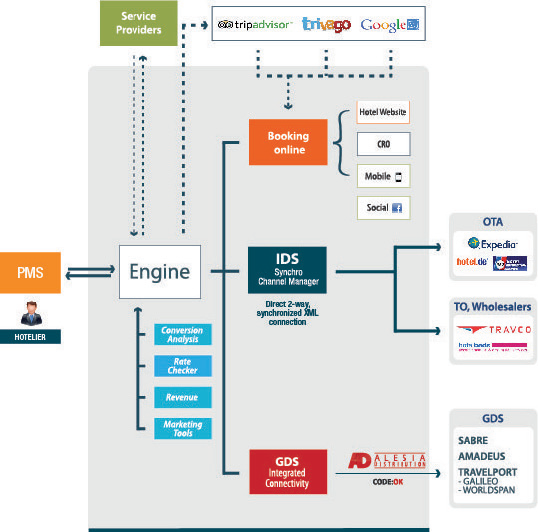 It has an integrated Synchro Channel Manager that connects 2-ways to over 100 OTAs and Metasearch channels. The myCRS platform includes a sophisticated software program for managing offline reservations: it provides prices and availability for the various active tariffs, taking into account all discounts and restrictions, just like the online booking engine. Manage requests from the website (e.g. requests to be contacted with an offer/quotation).